For us in our company, September is the busiest month since it is our fiscal year end. Say hello to long work hours and deadlines after deadlines. Mid-November, the Christmas spirit all over is in full gear (well, here in the Philippines, that is). Lots of Christmas-themed commercials (and I know a lot of us are waiting for the Coca-cola Christmas commercial. Admit it 😀 ). Malls start to get packed over the weekends with people doing their early shopping to avoid the Christmas rush. End of November would mean 13th month pay and bonuses for some. Others get these by mid-December. As early as December 1, there are already Christmas parties being held in different venues. Monito-monitas in companies, schools, groups of friends, etc. December means overspending (since there are lots of Christmas bazaars, sale events, and rush shopping for the holidays), heavy traffic jams (have you ever tried getting a cab around these times in the big metro? It is horrible! ), overpopulated malls and events places. And during the BER months, crime rates are quite high (lots of hold ups happening from what I heard). I know I have missed a lot of things that happen during these months but at quarter to 4 in the morning, these are what I can squeeze out of my sleepy brain cells. 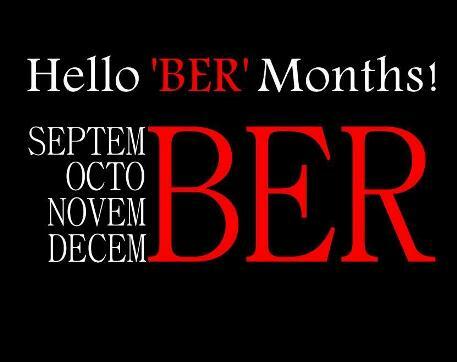 I love the Ber months and I love Christmas. You’re pretty on spot with what you listed. Hate the overpricing and even more terrible traffic but love Halloween and Christmas! It’s the most wonderful time of the year! *singing* Sorry nalang sa iba, but for me, once September begins, Christmas na! And the -ber season is my busiest, too! good for you, mommy! 😀 I do love the holidays pero napepressure ako pagdating ng september kasi ang haba na ng listahan ko ng inaanak.. LOL! When September comes my daughter starts to count the days because her birthday is coming which I dread as my birthday comes first. Then she’s excited about Christmas too. Christmas is my favorite season ever! Despite the craaaazzy gastos. this is the time of the year when taking a bath can be challenging! hahaha. Lumalamig na sya! It’s definitely beginning to feel a lot like Christmas!